I have always loved this piece by Robert Rauschenburg: his (1953) Erased de Kooning Drawing, now owned by the San Francisco MOMA. Yes, he really did erase a drawing by Willem de Kooning, who was at the time at the height of his fame. "Hope is a fat, obnoxious angel who barges in, sits down, and starts banging for a meal. God only knows where he’s been—his wings are filthy and sour smelling. He insults the cook, scares the children, manipulates conversation. People are tolerant because he’s not always like this, and he tends not to linger. When he returns, days or weeks later, he taps meekly at the back door. It’s open, he’s told. He steps inside and waits, avoiding eye contact. He’s told dinner will be served at six sharp. He knows where the clean towels are if he wants to wash up." My book is a comic philosophical novel about two germ-phobic obsessive-compulsive scholars of Duchamp, one of whom (the narrator) has inherited a small fortune after his parents have both died. The two men go on a road trip from Boston to Philadelphia in a Winnebago. They are driven by a beautiful multilingual Japanese-Canadian Harvard PhD student in women’s studies in religion, who is writing her thesis on representations of women in Abraham's sacrifices of his children. 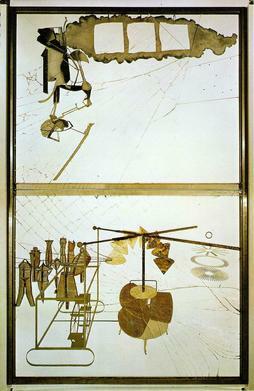 The two men are on a quest to buy a very expensive replica of an antique chocolate grinder with legs in the style of Louis Quinze that is represented in Duchamp’s sculpture (it’s that set of three drums on a table at the lower right side in the picture below). Along the way the narrator comes to terms with his symptoms, the nature of the feminine, and the inevitability of death– and also figures out how to make a pretty great hot chocolate.